Fall asleep to the sounds of the Pacific in this beautiful hostel only 20 meters from the beach. Here we're off the beaten gringo trail but with all the amenities you need, such as FREE WiFi, FREE breakfast, homemade dinners, Netflix, tour organisation, and a friendly welcome! A literal stones throw from the beach, you couldn't ask for a better location. We have a huge garden with plenty of hammocks for you to relax in and if you're looking for refreshments, we have FREE drinking water, and $1 coffee. Delicious hearty breakfasts of bread, eggs, caprese salad, fresh coffee and juice and one of our home cooked dinners will leave a great taste when you check out. The breakfast area also includes our TV with HD cable to watch all the latest sports events and Netflix for your favourite series. Mompiche is a small town with a chilled out vibe, but there are still a bunch of things to keep you occupied. A quiet nightlife at weekends, surf during the day, day trips to nearby beaches, hiking through the tropical forests, whale watching, exploring waterfalls, here you can do it all! There is no ATM in Mompiche (we do accept card though), so bringing cash is a must! All of this adds to the feeling that you've found yourself a little paradise in the middle of the world! Hidden House Hostel Cancellation policy: 2 weeks before arrival. Payment upon arrival by credit cards, debit cards,Cash is preferred. Maximum stay is 30 days. There is no availability for Hidden House Hostel Mompiche on your selected dates. What's an amazing experience I had at this hostel. Tranquility merely yards from the beach. Nathan was truly fantastic, his hospitality was warm and sincere and is local knowledge was invaluable. Other volunteers at the hostel were beautiful people and very accommodating, this was at a time when the weather was poor (rainy season) and the hostel was quite quiet. For the 4 days I was there I felt very welcome and made to feel at home. The hostel meals were also great value and delicious. 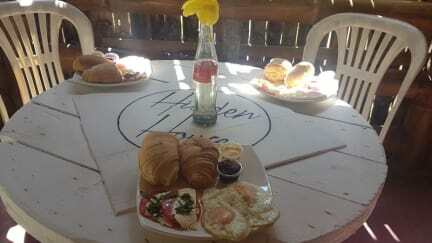 We had an awesome stay at Hidden Hostel- located at the south end of town, it’s a stones throw away from the beach, and next door to the best food in town. First room we had was noisy, but we were able to move to another room. Good breakfast, and delicious dinners you can opt in for ($4), plus a movie night! Great hosts, very clean, wifi works, hot showers - all the things! Great hostel run by super friendly Nathan, who is willing to help with anything and is a great source of information on what to do around Mompiche. Nice hangout area including tables and hammocks, kitchen, hot water showers (yay!) and organized dinners. The included breakfast was lovely, especially the passion fruit juice. Would definitely recommend staying here! Good place to stay for a short visit, right near the beach. Not much of an atmosphere but I assume that's because of the low season. Staff is very nice and breakfast is delicious! Lovely, friendly staff. Great breakfast, clean facilities and fab location.